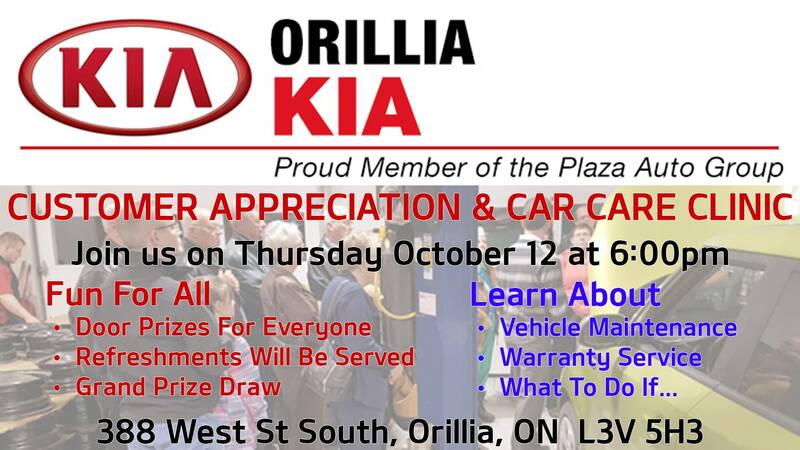 Join us for a Free Car Care Clinic during our Customer Appreciation Evening on Thursday October 12, starting at 6:00pm. With winter around the corner now is a great time to learn about “under the hood maintenance” and the things you can easily do to save some money and what you need to know in case of an emergency. Stop worrying about what’s “under the hood” and learn from our service experts. Please RSVP by phone at 705-558-4542, or contact us here. Learn more about Orillia Kia with tour a of our facility, from the new car showroom to the service areas, so when you come in for your regular scheduled maintenance you won’t be lost. Remember, we service all makes and models. We will answer all your questions about your vehicle so you can stop searching for answers and meet the people that will fix it right the first time.